Imagine your horse ambling along in walk, jogging instead of trotting, stumbling through a test constantly breaking the three beat canter. Not often do you see all of these faults in one horse but sure as night follows day you will experience these faults, at least to some extent, if you have not focussed your training on rhythm. Because in this small, rather oddly spelled word (should be ritham, right?) you have wrapped up a whole host of skills you and your horse must master; energy, even tempo, clear and regular paces, balance, rein contact … the list goes on! If you consider that impurities or irregularities in the rhythm, tempo and stride length are serious flaws in your horse’s ability to perform you can begin to appreciate that not only should you begin to focus on rhythm, but you should remain focussed on rhythm throughout your riding career. The walk is the gait that is most prone to impurities. You can have considerable influence on the way your horse walks which means that you can induce faults too. So, if you over ride the walk and push your horse into a faster, bigger walk than he is capable of, he will fall onto the forehand and tighten his back. Likewise if you attempt to collect more than your horse is capable of, his back will tighten and the walk will become irregular. Consider your ‘free walk on a long rein’. Your horse needs to show a clear, pure, four-beat walk and most likely is able to – as long as the rider is not touching reins. Then immediately the rider picks up the reins, the horse responds with unequal strides. This happens as a result of the rider using too much rein; not enough leg support and usually too heavy a seat. Go figure! Relaxing more and reducing the demands will in most cases restore the clear four beat rhythm. The safest way out of jigging is to start the working trot afresh, if it is a walk push the horse up into a working trot, establish the rhythm and relaxation and when the hind legs have started thrusting and the back has started swinging again, the walk will most likely be improved as well. The important point I would like to make here is, as with many, many other issues, you will not be able to regulate your horse’s paces without a good forward thrust, so first of all check that you have a forward thinking and willing horse, otherwise you will not have anything to work with. The majority of young horses and horses that are being retrained need to be reminded periodically not to slack off the forward propulsion; left to their own devices they will gradually fade after a few strides with good effort and that means the power with which their hind legs propel decreases, the gait loses its intensity and becomes dull. The result? the horse’s back stops swinging and the trot deteriorates into a jog, loses its gymnastic value and the horse’s musculature development over his haunches, back and top line is hindered. This, coupled with the potential issue of losing forwardness on the corners if the horse is not strong enough or trying to avoid the flexing of his joints (see Slowing Down and Speeding Up – Check the Flex) you may have to go back to basics and that means rhythm. Most untrained horses assume that the leg aid means ‘speed up’, so they increase the tempo as soon as the rider asks, thus losing rhythm. It is up to you to ‘clarify’ with your horse that the leg aid means ‘put more effort into your work, but keep your tempo’. This is achieved using an effective half-halt. (see Heavy on the Forehand for more tips about the half halt). So it is through systematic training that the horse should learn to adjust the tempo, adjust the stride length and adjust his energy levels independently of each other. Loss of impulsion and slowing of the tempo often happens because keeping the impulsion and tempo requires more strength from the horse. 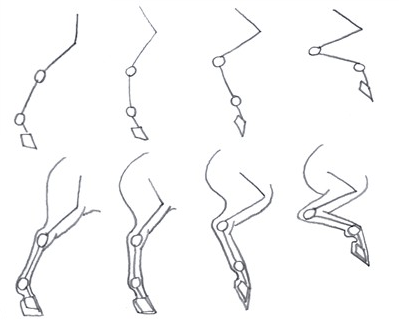 Pay really close attention to the regularity of the tempo, stride length and energy level throughout all exercises, patterns, and movements in order to develop the purity of the gaits to the highest level and to develop the horse’s strength and suppleness to its fullest potential in the process. You have to be progressive in your training. Your horse will respond with little and often. It will take six weeks for him to build the muscle power and stamina required to be able to efficiently execute new and demanding exercises. Too much too soon could result in injury. 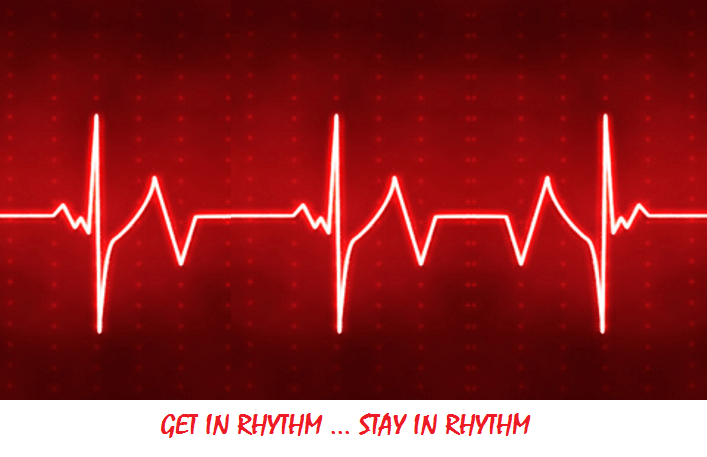 Here’s some food for thought, like your heartbeat is the ‘rhythm of life’ so rhythm is to your horse’s gymnastic development. Without it … not gonna happen! She is not chomping the bit so much. She turned & gave me that look when I let her go in the paddock, that look to say that I wasn’t a total bore today,, or that I was a worthy component in the Half Halt challenge,, or she is happy I found a real saddle maker to re pack the Roosli..( a second hand Classic Palatus Swiss saddle that fell from heaven). ,, enjoying your training wisdom so much,,, have 3 tests on Sunday,,, will practice trying to relax seat bones once I have impulsion in tomorrows practise session & I will get you the judges comments from Sunday this time.